When I was in high school, my favorite after school snack was pretzels with a big glass of cold pink lemonade...no joke. I love the combination. At the time I also loved to make this yummy pink lemonade pie. It was so easy...a combination of pink lemonade concentrate with a tub of whipped topping, frozen in a graham cracker crust. I had made it in one of my cooking classes at school and thought it was the greatest recipe ever. Fast forward 20 plus years to last month when my Cuisine at Home magazine arrived and to my surprise...what did I find inside...the yummy pink lemonade frozen pie recipe. I hadn't thought about that recipe for years! Crazy! Only Cuisine at Home had the ingenious idea of using a pretzel crust instead of graham crackers! Brilliance at it's best. All I could think about was high school and the yummy combo of pretzels with pink lemonade! 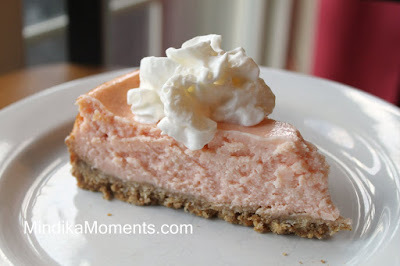 So all this talk about a frozen pink lemonade pie and you would think that's the recipe I'm posting. But it's not...sorry if I got your hopes up. Instead I was inspired to take my own twist and turn the frozen pink lemonade into cheesecake...with a pretzel crust. I'll probably post the frozen pie at some point. But you gotta try this version! It was pretty sweet...and tart too! 2. Pray a 10” spring form pan with cooking spray. 3. Combine the crushed pretzels, sugar and butter. Press into the bottom of the spring form pan. Be sure to press evenly. Place pan into the freezer. 4. In a large mixing bowl, beat the sugar and cream cheese on medium-high speed until well blended; about 3-4 minutes. 5. Blend in the pink lemonade concentrate. Then add the eggs one at a time incorporating each egg before you add the next. 6. Add the flour, sour cream, and vanilla extract. Mix until well incorporated. 8. Pour the batter into the spring form pan. 9. Bake at 350 for 30 minutes. Then turn off the oven and let the cake cool in the oven for 2 hours. 10. Remove and refrigerate for an additional 4-6 hours before serving. 1. Combine all ingredients in a heavy sauce pan. 3. Reduce to medium heat and allow to boil for 5-7 minutes. 5. Serve by drizzling over each slice of cheesecake.